Murder & Mystery on the English Riviera! 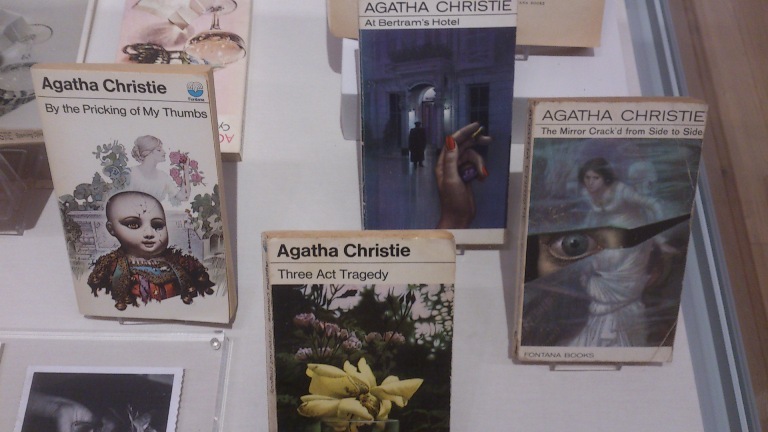 On a recent trip to Torquay, today’s guest blogger (while Simon has a bit of a rest) Matthew Batten discovered that you should always judge an Agatha Christie book by its cover! My love affair with Agatha Christie began many years ago with the wonderful Joan Hickson investigating a Sleeping Murder in the classic BBC Miss Marple series. As a nervy child, the image of the murderer’s gloved hands inching their way towards a young girl’s throat absolutely terrified me! And I loved it! Staff at my local library were delighted with my new found enthusiasm for Agatha Christie and set about introducing me to a back catalogue of crime delights. I’ve always wanted to visit Torquay, Agatha Christie’s birthplace and the setting for many a classic murder mystery. So, my partner and I decided on a last minute seaside break in the English Riveria to discover more about our favourite crime author. As a young boy, one of my favourite Agatha Christie books was At Bertram’s Hotel. Granted, it’s not considered a Christie classic but the paperback version I read had a deeply mysterious and haunting cover; the hand of a glamorous woman holding a bullet and a decorative object while a menacing figure looks on from the shadows of the hotel. I would stare at that cover and imagine all the untold secrets of Bertram’s Hotel. Imagine my delight when a last minute weekend away to Torquay just happened to coincide with an exhibition of Agatha Christie book cover artwork by Tom Adams. And amongst the many book covers was my favourite –At Bertram’s Hotel – looking just as mysterious and enticing as I remembered it. 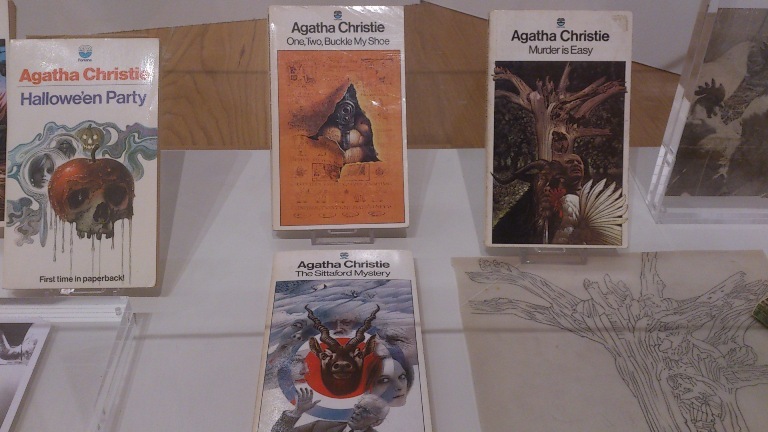 Tom Adams painted over 100 covers for Agatha Christie’s paperback editions. He would read the novels three times; quickly at first and then more in depth, making notes of characters, incidents and events. Adams avoided the more obvious crime imagery and instead created a macabre atmosphere through symbolism and often surrealist imagery. The book covers are extraordinary pieces of art in their own right but they also fit perfectly well on the front of a juicy Agatha Christie novel. Take Death in the Clouds, for example. A surrealist image of a giant wasp looming over a soaring airplane hinting at the plot involving murder and an insect sting on a plane! Or, the deliciously macabre Hallowe’en Party, the dripping apple/skull, the murderous looking carved pumpkin and an innocent girl reflecting in a looking glass – images that are impossible to resist! But not all of Adams’ covers were so dark. The simplicity of Sparkling Cyanide offers the reader clues of what to expect – a champagne glass, a stylish clutch purse and of course a sachet of deadly poison! Murder at a glamorous party, perhaps? How delicious! This rather superb, but sadly temporary, exhibition was held at Torquay Museum. However, the museum also houses a permanent Agatha Christie exhibition and tells the story of the Queen of Crime at Torquay. Fans of Joan Hickson’s Miss Marple and John Suchet’s Poirot will enjoy the seeing their costumes from both TV series’. There are also early edition books on display and plenty of photos of Agatha Christie’s life. The permanent exhibition takes up only one room but the rest of the museum tells the exciting story of past local explorers discovering the then uncharted continents and the exotic objects they brought back. Think Indiana Jones and you get the idea! It was absolutely fascinating and well worth a visit. 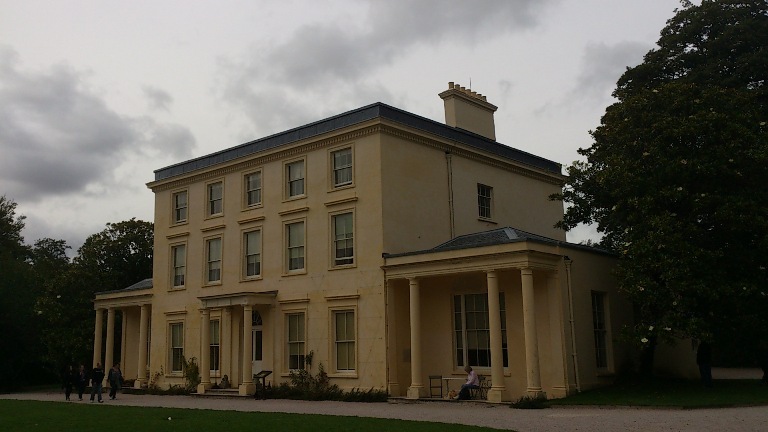 No trip to Torquay would be complete without a visit to Agatha Christie’s summer house, Greenway, now a National Trust property. Driving to Greenway house is discouraged as the property can only be accessed by a very narrow country road. 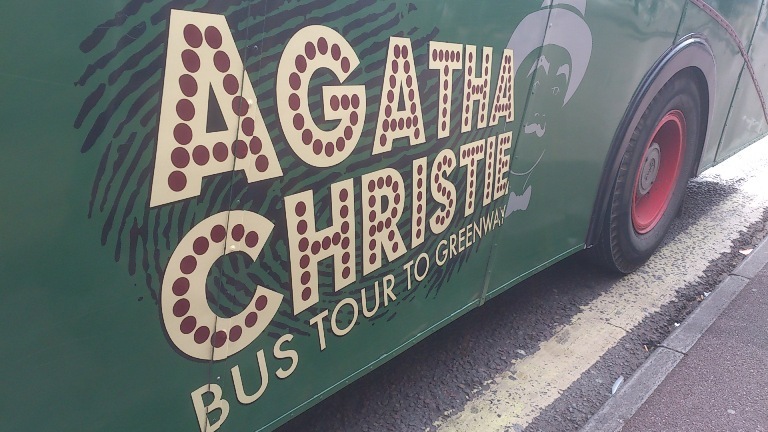 But why drive, when you can hop on board a vintage Agatha Christie tour bus and hear about the life and times of Agatha Christie from a very friendly and knowledgeable driver. The bus certainly drew some bemused looks from other tourists as we drove 40 minutes from Torquay to Greenway House. Entering Greenway House was like stepping back in time. It was a glimpse of another world. National Trust staff were also on hand to tell you more about the history of the house before and after Agatha lived there. Each room told the personal story of Agatha Christie, her hobbies, her lifestyle and her penchant for collecting small decorative boxes. These boxes were in nearly all the rooms but perhaps my favourite were the commemorative boxes for The Mousetrap. Little did she know her play would still be running 60 years on! There is a fully tuned piano in the living room, and National Trust staff encourage piano-playing visitors to tickle the ivories. I was so pleased when one visitor took up the offer as the music provided the perfect backdrop for exploring this elegant property. No visit would be complete without spending some time admiring the magnificent frieze running along the top of the library wall. Painted in 1943, while the house was occupied by the US coatguard, the frieze depicts key events of the Second World War. After the War an offer was made to paint over it but Agatha Christie insisted it remain. It is a striking image and quite breath-taking. 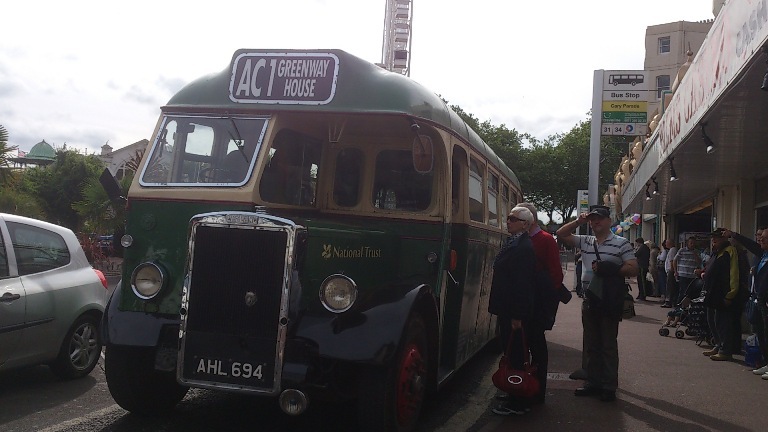 After a very pleasant couple of hours at Greenway house, it was all aboard the vintage bus to hear more about Agatha’s life in Torquay as we headed back to town. But our Agatha Christie adventure didn’t end at the bus stop! Oh no, we went on to watch an am-dram production of Cards on the Table which was showing at a converted church. There is no such thing as too much murder mystery on the English Riviera! I absolutely loved exploring Agatha Christie’s Torquay and finding out more about her life and influences. I look forward to re-reading her Torquay based novels with a renewed passion for classic Christie crime. There is even an annual Agatha Christie Festival each September – perhaps I’ll see you there next year? I really fancy that Festival, I do love a good Agatha Christie after all. A big thank you to Matthew for doing this for me. I almost feel like I managed to go myself. There are some authors that as a reader I will grab off the shelf if a) I am in some kind of reading funk or b) I have just read rather a heavy, yet rewarding, tome and need something in between starting another novel I suspect will be similar. Agatha Christie is one author that fits the bill for both, though that said I do have a random particular demand with a Christie, it can’t be a Poirot, I don’t like him for some reason, whereas I love a Miss Marple or standalone tale. So after something rewarding but weighty reading I decided it was time to pick up ‘The Moving Finger’ the third (or fourth if you include ‘The Thirteen Problems’ short story collection) Marple novel, a series I am trying to read sparingly. Jerry Burton is sent from London to the sleepy village of Lymstock on doctors orders and brings his sister Joanna in tow. Initially they are utterly charmed with the idyllic surroundings and quaint people that they meet. Yet soon they receive an anonymous poison penned letter accusing them of being lovers not siblings and they soon discover that most people in the village are getting equally scandalous letters too. Things soon take an even darker twist when one of the receivers of these letters dies, at first people think it may be suicide until the facts start to point to murder and another soon follows. Hopefully that hasn’t given too much of the plot away, however I am about to let you into a small secret which led me to being rather frustrated with this book. Miss Marple herself doesn’t actually appear in the book until three quarters of the way through the novel, and then she is barely on ten pages or more as the novel closes. I am sorry to mention a negative so soon but it was Miss Marple I was really reading this book for, and rather like with ‘At Bertram’s Hotel’ (which I read out of order) I found myself most annoyed that my favourite character was barely in the book. That said, to be fairer to the book and its author, ‘The Moving Finger’ isn’t half bad. Interestingly though I would describe it rather as I have the village of Lymstock, it is a mystery which is quite sleepy with dark edges. It was entertaining, had me guessing and kept me reading but it bumbled a little, lots of characters were introduced but interestingly more for Christie to write about quirky characters I felt than to create more suspects, which is normally the opposite of what I say with a Christie novel. What I did really enjoy though in ‘The Moving Finger’ and stopped me from giving up (well apart from reading on for Miss Marple to barely appear) was Agatha Christie’s sense of humour. I don’t know if I simply haven’t noticed it before, or if it’s particularly prevalent in this book but there seemed to be a wry smile in almost every other page. It could be the descriptions of a character, one of the towns’ effeminate men gets this a lot, or it could just be a dig at the social ways of the time, either way it is definitely always there. ‘In novels, I have noticed, anonymous letters of a foul and disgusting character are never shown to women. It is implied that women must at all cost be shielded from the shock it might give their delicate nervous systems. All in all I would have to say that ‘The Moving Finger’ isn’t my favourite Christie novel, but I still really rather enjoyed it. I had no idea ‘whodunit’, I enjoyed the setting of the English countryside where no one ever really knows what is going on behind closed doors and I really liked the underlying humour. Is it odd to say that with this book I felt I knew Agatha Christie a little better, because it is strangely how I felt? I don’t know if it’s the way I am feeling during my recovery period from operation one but crime has taken over again and is close to pushing all Orange longlist reading out of the window. I have discovered a few new crime novelists of late but every so often you need to go back to the joys of the long loved masters and so I thought that it was time to turn my attentions back to Agatha Christie, I do have a rather large amount of her books to hand, and so I opted for one I new nothing about ‘Parker Pyne Investigates’. How people can sneer about Agatha Christie and her novels. Whenever I am in need of something that I can just get completely lost in or when I need something cleansing between other reads then she is just the ticket. As ‘Parker Pyne Investigates’ not only does Agatha Christie show that she truly is the master of plots and twists, she also makes short stories look effortless and in this collection, which I wasn’t expecting to be a collection at all, she also shows a slightly different side to her mysteries which I found rather interesting. Parker Pyne is not a detective; in fact the balding, plump middle aged man calls himself a ‘specialist in matters of the heart’ and believes he is a man who can make people happy. Every day he runs an advert in The Times newspaper ‘Are You Happy? If Not, Consult Mr Parker Pyne’ and in the first half of these stories that’s just what we read. Unhappy husbands, worried wives, disillusioned rich heiresses, etc pass through Parker Pynes doors and in each case he manages, with his trusty sidekicks ‘Claude Luttrell was one of the handsomest specimens of lounge-lizard to be found in England. Madeline de Sara was the most seductive of vamps’ in the most bizarre ways to make them happy. These might involve sending a bored clerk on an invented adventure murder with Claude or Madeline playing a role, sometimes though accidental adventures take over too. My favourite of this half was ‘The Case of the Distressed Lady’ which saw a story (and at only ten pages I can’t say too much on the plot) but it involves three twists none of which I saw coming. The second half of these tales takes a very different twist as instead of Parker Pyne having the mysteries come to him in his office, the mysteries seem to come to him when he is on random trips abroad. Possibly the most famous short stories of this half of the book is ‘Death on the Nile’ which I thought was a Poirot story, I had no idea it was Parker Pyne. ‘Death on the Nile’ is also one of the few tales in the book that involves murder, in fact if you are after a murder collection best be off with Miss Marple or Poirot really, but interestingly the fact the crimes and cases in this book weren’t murders made it really stand out. You have con-artists, cheating spouses, kidnappers and jewel thieves instead and in the second half as I mentioned in destinations such as Egypt, Greece and Bagdad. I bought this book myself yonks ago when I was on an Agatha Christie Fontana edition spree. Has anyone else read the Parker Pyne collection and been pleasantly surprised by how different it is, or did the difference put you off? Do you have a favourite Agatha Christie novel? Have any of you read any of her other short story collections you could recommend? Should I finally try a Poirot (I have actually become addicted to an Agatha Christie PC game while I have been recovering, ha) or is it time for another Marple next? 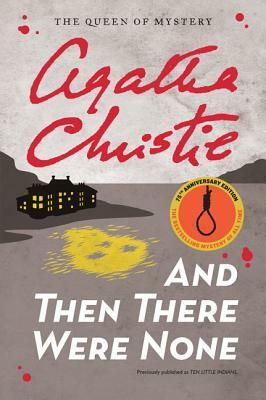 From the title of today’s post you could be mistaken for thinking that Agatha Christie had co-written some novels in the vein of James Patterson with some of his thrillers, however this is not the case. In fact what we have here is an adaptation of one of Agatha Christie’s Poirot novels ‘The Big Four’ which has been turned into a graphic novel by Alain Paillou. I am not sure if this was something that has been done to encourage a new readership to Christie or not? 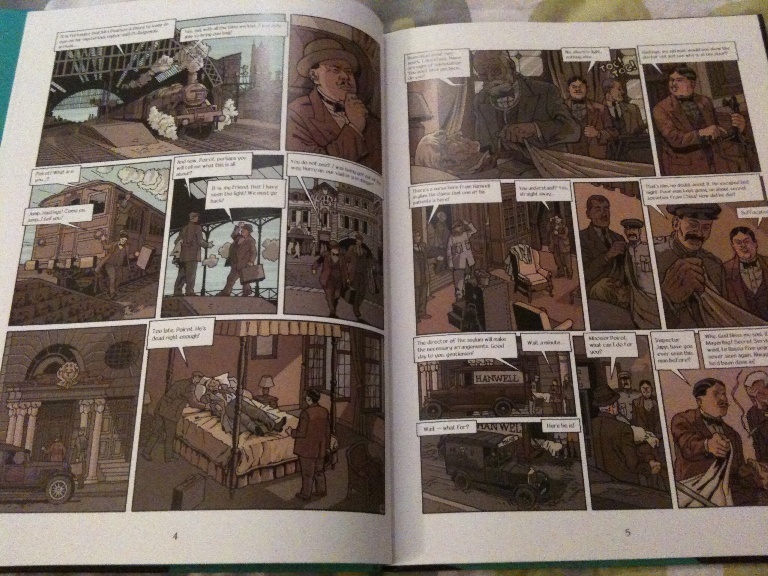 When I saw it at the library, with my new found appreciation for graphic novels, I thought it might be something interesting to try. I was also aware it could be a book that I either loved or loathed. It appears that ‘The Big Four’ was something quite different for Agatha Christie, and not just because in this case it’s been adapted into a graphic novel. The premise is highly ambitious as this sees Hercule Poirot thrown into the world of an international spy thriller along the lines of a James Bond novel, in fact at once point there is a laser gun harnessing atomic energy in a secret mountain hideout that could leave its creator holding the world to ransom. But wait a minute I have gotten ahead of myself, what’s the story? As the book opens Captain Hastings is returning to England (not being overly familiar with the Poirot novels I am assuming he is in few as Watson to Poirot’s Holmes?) to see his friend Hercule Poirot. Once at his friends flat a troubled man arrives clearly in fear of his life from ‘The Big Four’ a group, it would initially appear, of evil assassins with some dastardly plot to hand. The man of course is then found dead within hours. I am loathed to say anymore for fear of giving too much away and also in part because through this medium I never really got to grips with the whole set up like I think I would have in the book itself. The thing that I love about Christie is her plotting, the red herrings she leaves and the quirks she pops into her characters, all of these seemed to be lost in a graphic version. This version, though I haven’t read the original and maybe that’s part of the problem, of ‘The Big Four’ seemed so focused on the action on a comic (and I don’t mean ha, ha) level that it lost everything else. Some people may say thats all there is to a graphic novel but having read another recently I know its not true. There wasn’t really any suspense it was just action, action, action and seemed to be missing out on the background. Maybe this isn’t in the novel of ‘The Big Four’ but with Christie I would find that very hard to believe considering all the other books that I have read by her. I also need to mention the actual pictures, which whilst being far better than I could ever draw, they didn’t seem to fit the book. It looked more like Tintin than anything else (I like Tintin so that’s not a snipe) and Poirot isn’t Tintin. They were also all really dark by which I don’t mean graphic I mean brown. In fact maybe this was an added problem I threw in. I expect graphic novels to be quite colourful and this was a bit dull and murky, I wanted a splash of something to give it life and yet nothing ever did. I wonder what Agatha would think? Weirdly I actually want to try another one of these graphic Christies. I don’t like to write something off until I have given it a chance or two and this wasn’t so bad it put me off them full stop. It has really made me want to read the novel version of ‘The Big Four’ (which of course, being sod’s law, I don’t own a copy of) and see just what I was missing, as even though I know the ending I want to see just how Agatha managed the scope of it’s premise. Have any other Christie fans read the original of ‘The Big Four’ and is it worth a read, have any of you tried graphic versions of Agatha’s other novels? Finally another question that I was actually discussing with a friend last week (we were discussing Scott Pilgrim which my friend loves and I then looked at in Foyles) and this book highlighted it again… Just what is the difference between a graphic novel and a comic, is it merely the length like a novella and a novel – or is there more to it than that?